^ "Toronto: Jason Reitman Lining Up His Next Film". The Hollywood Reporter. September 4, 2013. Retrieved December 19, 2013. 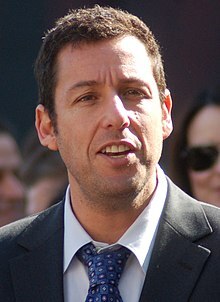 ^ "With Four New Adam Sandler Films, Netflix Takes Aim at Theaters - NYTimes.com". mobile.nytimes.com. Retrieved December 13, 2015. Punch-Drunk Love is a 2002 American romantic comedy-drama film written and directed by Paul Thomas Anderson and starring Adam Sandler, Emily Watson, Philip Seymour Hoffman, Luis Guzmán, and Mary Lynn Rajskub. Sandler stars as an entrepreneur with severe social anxiety who is set up on a date with his sister's co-worker. The two immediately fall in love with each other but he is forced to defend his new love interest and himself from thugs attempting to steal his identity and extort him. Kevin George Knipfing, better known by his screen name Kevin James, is an American actor, comedian, screenwriter, and film producer. He is best known as Doug Heffernan on the CBS sitcom The King of Queens (1998–2007) and has appeared in the films Hitch (2005), I Now Pronounce You Chuck and Larry (2007), Paul Blart: Mall Cop (2009), Grown Ups (2010), Zookeeper (2011), Here Comes the Boom (2012), and Pixels (2015). From 2016-2018 he starred in another CBS sitcom, Kevin Can Wait. You Don't Mess with the Zohan is a 2008 American comedy film directed by Dennis Dugan and produced by Adam Sandler, who also starred in the film. It was the fourth film that included a collaboration of Sandler as actor and Dugan as director. The film revolves around Zohan Dvir, an Israeli counterterrorist army commando who fakes his own death in order to pursue his dream of becoming a hairstylist in New York City. 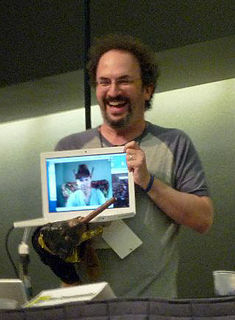 The story was written by Adam Sandler, Judd Apatow, and Robert Smigel. It was released on June 6, 2008, in the US and on August 15, 2008, in the UK. The film grossed $199.9 million worldwide from a $90 million budget. Grown Ups is a 2010 American comedy film directed by Dennis Dugan and stars Adam Sandler, Kevin James, Chris Rock, David Spade, and Rob Schneider. It depicts five lifelong friends of a middle school basketball team and their families reuniting for a July Fourth weekend after learning about the sudden death of their coach. Hotel Transylvania is a 2012 American computer-animated comedy film produced by Columbia Pictures and Sony Pictures Animation. It was directed by Genndy Tartakovsky from a screenplay by Peter Baynham and Robert Smigel and a story by Todd Durham, Dan Hageman and Kevin Hageman, and stars the voices of Adam Sandler, Andy Samberg, Selena Gomez, Kevin James, Fran Drescher, Steve Buscemi, Molly Shannon, David Spade, and CeeLo Green. The film tells a story of Count Dracula, the owner of a hotel called Hotel Transylvania where the world's monsters can take a rest from human civilization. Dracula invites some of the most famous monsters to celebrate the 118th birthday of his daughter Mavis. When the "human-free hotel" is unexpectedly visited by an ordinary 21-year-old traveler named Jonathan, Dracula must protect Mavis from falling in love with him before the hotel's guests learn that there is a human in the castle, which may jeopardize the hotel's future and his career. Hotel Transylvania 3: Summer Vacation is a 2018 American computer-animated comedy film produced by Sony Pictures Animation and distributed by Sony Pictures Releasing. 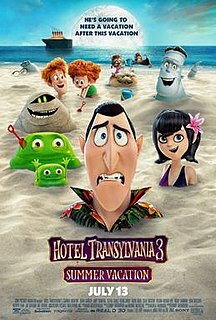 The third installment in the Hotel Transylvania franchise and sequel to Hotel Transylvania 2 (2015), it was directed by Genndy Tartakovsky and written by Tartakovsky and Michael McCullers, and features Adam Sandler, Andy Samberg, Selena Gomez, Kevin James, David Spade, Steve Buscemi, Keegan-Michael Key, Molly Shannon, Fran Drescher, and Mel Brooks reprising their roles, as well as new additions to the cast including Kathryn Hahn and Jim Gaffigan. In the film, Dracula finds love with a ship captain named Ericka Van Helsing while on a vacation on a cruise with his family and friends, but Mavis discovers that Ericka is actually the great-granddaughter of Abraham Van Helsing, Dracula's arch-enemy. The Meyerowitz Stories is a 2017 American comedy-drama film directed and written by Noah Baumbach. 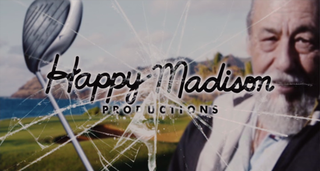 The film stars Adam Sandler, Ben Stiller, Dustin Hoffman, Elizabeth Marvel and Emma Thompson, and follows a group of dysfunctional adult siblings trying to live in the shadow of their father.